Inca Minerals Ltd (ASX:ICG) confirmed today that the earn in agreement (EIA) negotiated with South32 Group Operations Pty Ltd (South32) had been officially executed on 30 March 2019. South32’s agreement to inject a minimum of US$9 million into exploration at Inca’s copper-zinc Riqueza Project in Peru is a milestone development for the group as South32 is an $18.7 billion mining giant. South32 is renowned for being measured with its targeting of project investments, focusing on those that potentially offer high grade, long life, low-cost metrics that are situated in mining friendly jurisdictions. The latter is certainly the case for the Riqueza Project with the Peruvian government recognising the financial benefits of mining activity in the country. While it is early days in terms of determining whether the mineralisation identified by Inca Minerals to date will form the basis of a commercially attractive project, South32 has obviously seen enough in the exploration results released to date to provide a reasonable level of confidence in the project’s prospects. Consequently, the EIA is an endorsement of the prospectivity of the project and having South32 as a partner provides both financial support and expertise in polymetallic exploration and development, a discipline which is particularly significant given the nature of the targets at Riqueza. Reflecting on data accumulated in 2018 as a result of extensive drilling, it isn’t surprising to see a major such as South32 taking an interest in the project. 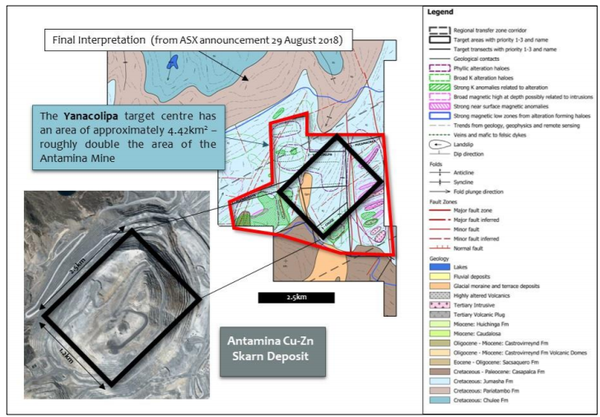 A 53 page geophysics summary compiled by the independent Resource Potentials group concluded that a large to giant sized carbonate replacement deposit (CRD) could occur within the Yanacolipa copper-zinc target centre (see below) in the north-east part of the project, which is one of three large target centres recognised at Riqueza. Following the completion of the surface geophysics interpretation, Resource Potentials commenced three-dimensional modelling to better define the targets. This work is essential for exploration planning, and the modelling which covered the entire survey area and specific targets is now complete. Three-dimensional magnetic vector inversion (MVI) modelling methods were used and solid 3D shapes generated to help visualise the shape of the porphyry/porphyry-skarn like targets, one of which is pictured below being of significant interest as it extends below the digital terrain. The 4.4 square kilometre, 2-D and 3-D modelled shape, magnetic and radiometric data signature and geological setting of Yanacolipa is compared to the giant CRD Antamina deposit. This independent comparison is contained in the geophysics report compiled by Resource Potentials. Based on this comparison of Yanacolipa and Antamina, Yanacolipa is defined as an Exploration Target in accordance with JORC Chapter 17 (2012) (Appendix 2). In contrast, Antamina is an operating mine owned by BHP (33.75%), Glencore (33.75%), Teck (22.5%) and Mitsubishi (10%) and while the potential quantity and grade of Yanacolipa is conceptual in nature and requires further exploration, the nearology is encouraging. 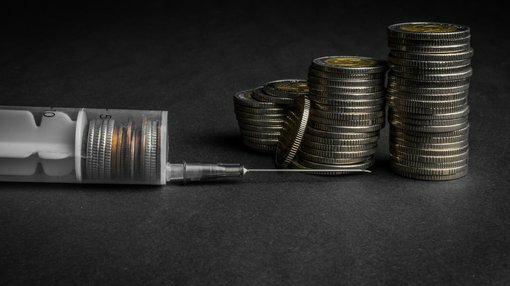 The agreement between Inca Minerals and South32 is similar to most such agreements in that it involves staged payments which result in the funding party gaining increased equity interests in the project as various milestones are met. In what is also a common aspect of EIAs, Inca must transfer the title to all Riqueza concessions to a newly incorporated and wholly owned Peruvian subsidiary which in this case is Brillandino Minerales S.A.C. Having established this facility, South32 will channel funding through the subsidiary, and subsequent initiatives such as increased equity interests will be recorded in that facility. A minimum amount of US$9.0million by the end of year 4 (inclusive of the US$6.0 million in years 1, 2 and 3). South32 may elect to provide the Phase 1 funding in less than 4 years should it wish to do so. South32 may also elect to withdraw on completion of each annual program/annual budget during Phase 1 and, in the event of such withdrawal, or in the event of default on the Phase 1 Funding, South32 forfeits its entire interest in the project/project company and both Inca and South32 are released from all further obligations or liabilities in respect of the EIA. Inca will be the project operator unless, at any time after full payment of Phase 1 Funding, South32 elects to assume operatorship. On full payment of the Phase 1 funding and South32’s acquisition of a 60% interest in Brillandino, a shareholders’ agreement will be entered into by Inca, South32 and Brillandino. South32 may then elect to acquire an additional 10% interest in the project company in a second phase in return for funding all project expenditure needed to conduct and complete a project pre-feasibility study. On completion of the earlier of the Phase 1 funding obligation or the Phase 2 funding obligation, Inca and South32 shall fund all further project expenditure in proportion to their equity interest in the project company.